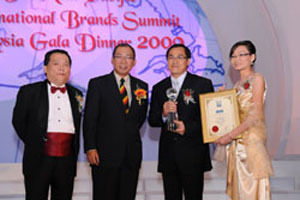 At a Gala Dinner attended by participants from 16 countries held at Grand Ballroom, Putrajaya Marriot Hotel, Malaysia, Procrystal Brands (M) Sdn Bhd was awarded the winner of the 5th Asia Pacific Super Excellent Brand Award 2009 for the category of PRODUCT EXCELLENCE. Procrystal, is recognized as a leader brand that has produced high quality, stylish products and services on a regional level based on the criteria i.e. Quality, Value, Trustworthiness, Credible Image, Customers’ Satisfaction and Brand Management. This Product Excellence Award is presented to reputable brand corporations with a good product track record and a high performance value in the market place. Procrystal Brands (M) Sdn Bhd was the 1st Car Care Products being awarded this prestigious award. Photo shows CEO (Mr Swee T.S.) and CFO (Ms Wong W.Y.) proudly receiving the award from Deputy Minister Of Finance Malaysia Dato’ Wira Chor Chee Heung and President Of Asia Entrepreneur Alliance Prof. Dr. Denver Tan. Procrystal Brands (M) Sdn Bhd has received another prestigious award which was The BrandLaureate-SMEs Chapter Award 2009 for the category of BEST BRANDS IN AUTOMOTIVE-CAR CARE in the Asia Pacific which was held at Grand Ballroom, Shangri-La Hotel Kuala Lumpur graced by Y.A.B. Tan Sri Muhyiddin Hj Mohd Yassin (Deputy Prime Minister of Malaysia). The award is accorded based on Brand Strategy/Identity, Brand Culture, Integrated Brand Communications, Brand Equity, Brand Performance & Profitability. The BrandLaureate-SMEs Chapter Awards recognizes the best of brands from the small and medium enterprises and is in line with the objectives of the Asia Pacific Brands Foundation to unearth emerging brands from the SMEs and nurture them into successful brands. Winners of The BrandLaureate-SMEs Chapter Awards have successfully established their footprints in both local and global markets. Procrystal Brands (M) Sdn Bhd was also the 1st Car Care Products being awarded this prestigious award. Photo shows CEO (Mr Swee T.S.) and CFO (Ms Wong W.Y.) 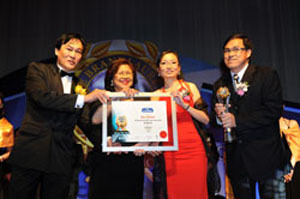 proudly receiving the award from Tan Sri Rafidah Aziz and CEO Of Asia Pacific Brands Foundation Dr. KK Johan.